Unifying data from different vendors and applications. The city network layer offers the foundation for the multi-application platform provided by the GreenStreet smart city solution. Moreover, devices from multiple applications support the city network to become the foundation for the smart city solution. Gateways are devices that manage the messages from the meshed network and send it to the IoT Integration platform. All these gateways are access points to the same integration platform and are common resources for all end devices. The end devices will automatically find the most optimal route to a gateway. Gateways can use cellular, Ethernet or fiber optic connectivity to connect via the internet to the integration platform. The integration platform level is the main IoT cloud services, including the message broker. This layer handles the normalization of all data and provides a uniform communication between devices and services.This is the smart city core, and the above levels are service levels that must use the smart city API to access device information. The smart city dashboard provides an overview for all devices, while the next levels are service objects providing an application specific interface for the targeted users. Capelon encourages a dynamic ecosystem with applications and services for the city. Our GreenStreet partner programs ensure that different partners can integrate devices and offer various city services to the city by using the smart city API. On the service level, it is also possible for partners to add modules to extend integrations to other business systems. One reason for a smart city initiative is to provide transparency and open up data from the smart city platform. Another reason is to facilitate data analytics and refine data in order to create new innovative servicesthat can add value to the system. 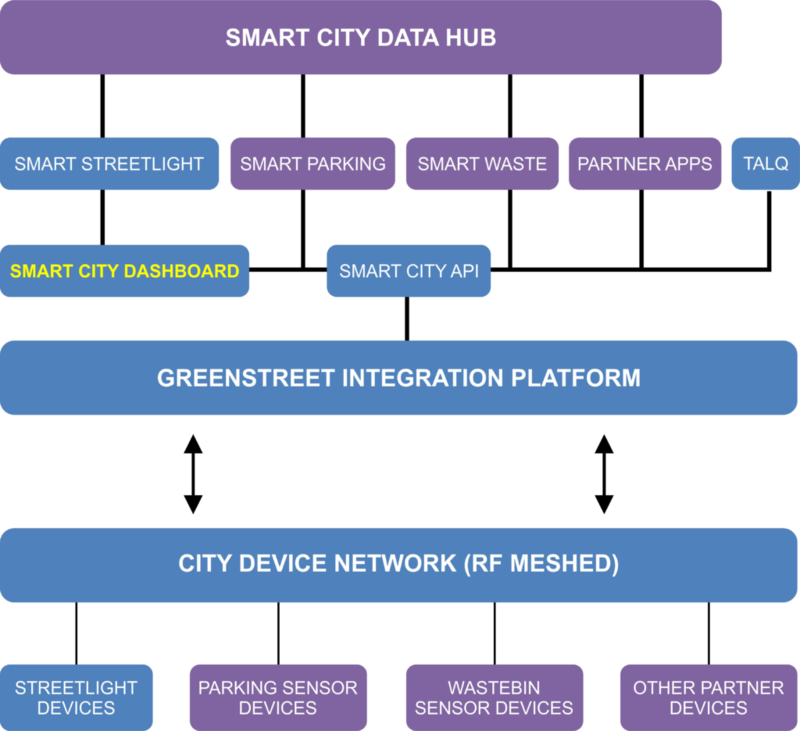 This initiative is represented by the smart city data hub diagram. Capelon provides the possibility of learning more about creating services in the GreenStreet smart city lab. It is a data-driven lab concept where smart city data together with other open data sources can be used and combined to show the possibility of creating innovative cities and public services.